Sometime around the end of last year I signed up for a project which required me to create the modest amount of 30 pieces of miniature artworks. I became really enthusiastic about the project from the get-go to create this tiny universe which quickly found its name, “Microverse”. The only real restriction to this project was the scale of the artworks, they were not to exceed 5 x 8 x 2 cm in size. That is minute for someone who normally creates room filling installations. With this in mind I gathered all my favorite materials and a bunch of new ones scattered about my studio and slowly but surely started to work on the pieces. The overall driving force behind the various forms is that the shapes are derived from nature, in the broadest sense. Not quite existing in real life but convoked to life in my studio. These tiny works are reminiscent of the shapes and structures found in feathers and bones. Another important source of inspiration for this project was found in the endlessly twisting möbius strip. With many of Microverse’s artworks showing us the external as well as the inner workings in a similar fashion. It’s easy to get lost between the layers of materials and dimensions, within transformative shapes. In a way the miniature artworks present a voyage between what can be glanced at the surface or an intimate meticulous inner depth. Some objects feature natural patterns, ring shapes, serpent forms or winding coils, others represent a personification of phenomena like the blood moon, an eclipse or are a direct symbolization of emotion such as a burning heart. The creative process for this project was also an inspiration onto itself. Working on so many different pieces really allowed me to play with the subject and take a free approach in establishing the overlapping tone and theme. Since the pieces were required to be so tiny I figured their forms could be similar to what you might encounter when studying samples under a microscope. Peering through a microscope gives you a limited radial scope of your subject, as these artworks will be boxed individually (more on that below) the actual framing of the pieces became a challenge as well. You can’t break the laws of physics but you can surely experiment and bend the rules a bit. I incorporated my favorite color palette. Varying through radiances of white to deep shades of black dark-dyed flax. 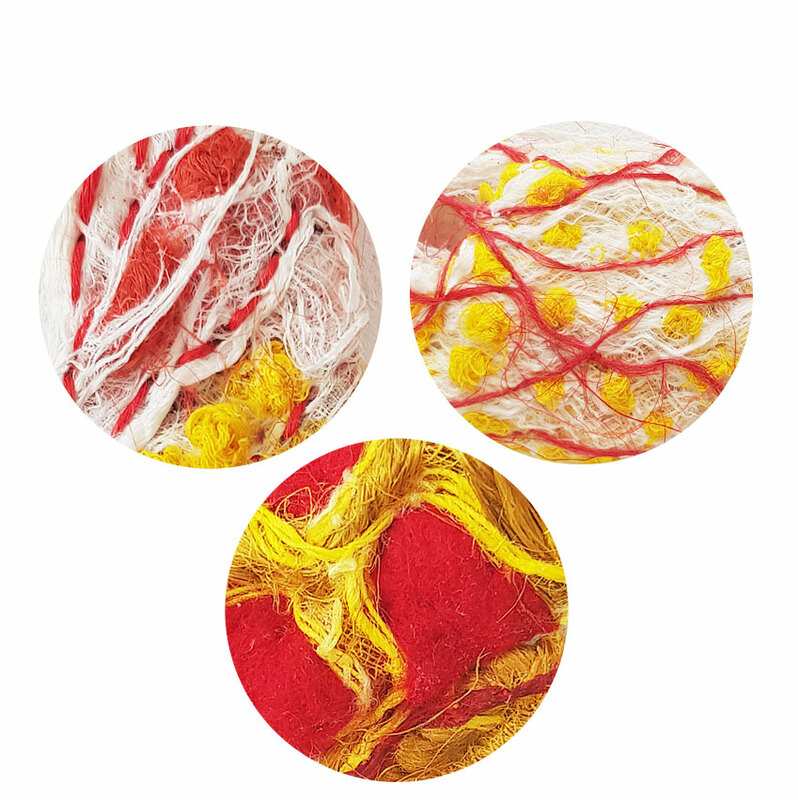 Warm tints of golden yellow hemp and cotton fibers to burning scarlet reds of merino wool. The materials that I’ve used in creating the Microverse are really diverse. I did not just use only natural fibers but extended my fabrics to twisted, embroidered and wrapped flax, linen thread, cotton and silk fibers as well as nylon net and skai (artificial leather). The Microverse collection is growing, there are currently thirty-two pieces but the ‘verse is surely expanding so keep an eye out. Quick word about the project that Microverse will be part of. By origin a German concept called Kunstautomaat or Art vending machine when directly translated. The machines look similar to a cigarette vending machine and contain similar shaped packages yet the content is of an whole different level of enjoyment. Within the packages you’ll find a tiny artwork that is yours to keep for just two Euros. Considering the love and effort artists put into making these, that is a steal. If you’ve always wanted original art in your house, here’s your chance. You can even boast about having an art collection if you wish. And obviously it’s your chance, but a totally random one at that, to own an Original numbered piece of the Microverse. There is more in store for Microverse, keep an eye out for future developments.